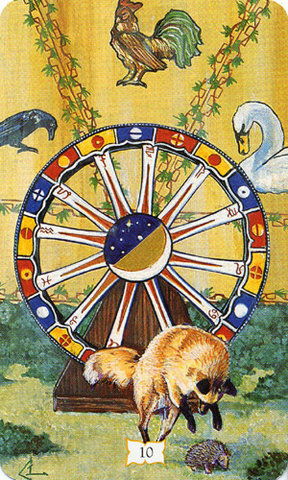 If you get The Wheel of Fortune card in a reading, do you feel optimistic or overwhelmed? This card corresponds to Jupiter (who's just moved into Gemini) and it brings up some interesting issues around the idea of luck. It's generally a positive card and brings positive changes. But there's always an element of chance associated with it. Some clients really don't like it because it suggests that things are out of their control. They don't have much say about where the wheel stops. All you can be sure of with this card is that what goes up must come down (and vice versa). In a reading, it says that things will not stay the same. The cycle of life (or your situation) is about to turn and you're just along for the ride. As I said, it generally brings positive change but there's karma involved. Literally, what goes around comes around with this wheel. The best way to deal with this card is to accept what it offers. Look at the surrounding cards to see if the change is positive or a crises in the making. Either way, work with it. Seize the opportunity or deal with the problem.